​New trendy weight loss bread! Low carb, gluten free and tasty. We swapped out traditional cream cheese in favor of ricotta or cottage cheese for a protein packed flavor punch! With 6 simple Ingredients, this soft, airy bread can be prepared from start to finish in under 30 minutes. For an antioxidant boost, use cinnamon instead of herbs for a sweet touch. * You can find cream of tartar in most grocery stores or Walmart. set oven to convection bake to speed up baking time. 2. Separate the egg whites and the yolks. Add the cream of tartar to the egg whites and with a hand or stand mixer, beat on high until the froth turns into firm meringue peaks. 3. Place the cheese in a seperate bowl. Add the egg yolks and beat in one at a time. Scrape the bowl and beat until the mixture is nice and smooth. Then beat in the herb seasoning, salt, and garlic powder. 4. Gently (very gently!) fold the firm meringue into the yolk mixture. Spoon 1/4 cup portions of the foam onto the baking sheets and spread into even 4 inch circles, 3/4 inch high. Leave a little space around each circle. 5. Bake for 15 minutes, and check on bread. The bread should be golden on the outside and firm. The center should not jiggle when shaken. Bake an additional 10-15 minutes if needed. Cool for several minutes and serve! 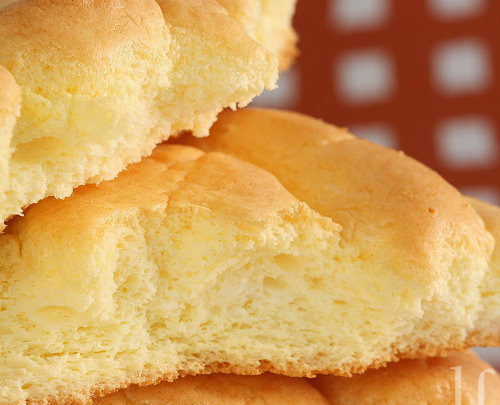 Cloud bread can be stored in an airtight container in the refrigerator for several days.